How do we celebrate 420? Of course we smoke weed and practice yoga together! 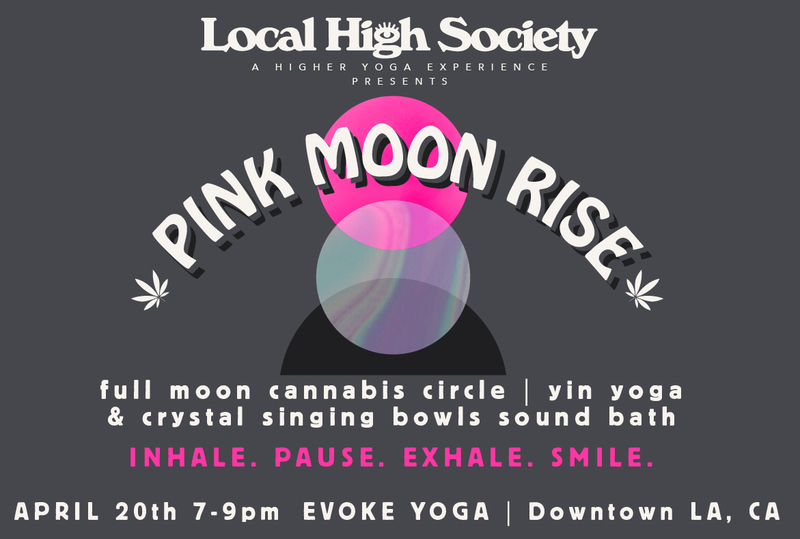 Vibe high with your friendly neighborhood Local High Society for an evening of Full Moon Cannabis Circle, Yin Yoga and Crystal Singing Bowls Sound Bath. We will begin our evening with Full Moon Cannabis Circle to elevate, breathe, set our intentions, and meditate. Followed by a Chakra Activated Yin Yoga accompanied by Crystal Singing Bowls Sound Bath. Be prepared to journey into a higher dimension and transform to your higher self! BYOCannabis or share with us. We are sharing limited CBD/Hybrid and Lavender/Chamomile infused spliffs. Our friend High End Desserts is sharing samples of their yummy infused treats! 7:00pm - Check In - Set up your space. 7:15pm - Door Locks - Please arrive early, we will promptly lock our door at 7:15pm. 7:20pm - Full Moon Cannabis Circle - Elevate, breathe, set intentions, meditate. 7:30pm - Yin Yoga & Sound Bath - Chakra Activated yoga practice. 8:30pm - Class Ends - Feel free to stick around to smoke and mingle, make some new friends! 9:00pm - Event Ends - Hope you had fun with us!